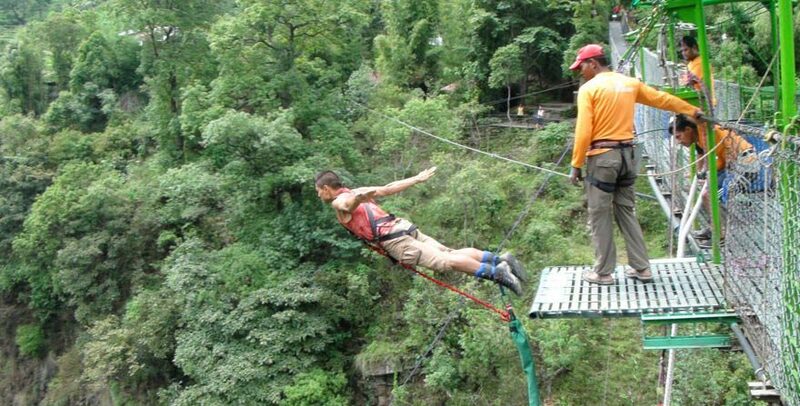 Bungee jumping is an extreme sport in which people jump from higher ground such as a bridge with an elastic rope tied to their ankles to stop them from hitting the ground. The rope will not break because it is stretchy . When the rope has stretched all the way, the jumper bounces back up. When people jump they wear safety equipment like helmets and a harness. They would throw themselves off wooden platforms with their legs attached to vines to prove their manhood. Bungee jumping has several dangers. The rope has to be the right size for your weight, or it may break. The safety harness has to fit properly or the force of the drop could cause a person’s bones to break. The rope has to be the right length or a person could hit the ground before being stopped by the rope. Noel Edmond’ BBC programmer The Late, Late Breakfast Show was scrapped in 1986 after Michael Lush,. A member of the public who had volunteered to take part in a stunt, died in a bungee jump that went wrong. A clip came loose during the jump, sending him plummeting to the ground. Despite its inherent risk, there have only been a handful of deaths from bungee jumping. Bharal Adventure Assure you your safety with full guarantee Frequent injuries have included dislocations, rope burn, back injuries and eye trauma.So, you must try it with the experienced and reliable one. Don’t worry about your safety it’s our responsibility. You won’t have to worry you just need to feel the moment. Bharal Adventure offers you this thrilling moment with full safety and full experience. Just jump out that’s all what you need to do. Our journey starts with a short drive from Kathmandu along the Araniko Highway to the Last Resort, our bungee jumping spot. As we reach the jumping site, the technicians will arrange for your free fall. All you have to do is fall freely to take full fun of the adventure. So, gather your guts and try out the free fall experience. It’s a memory for lifetime. What’s there to worry about? You just have one life and one chance, own it. So that you will be able to experience another thrill in your life.